The 1x4 HDMI splitter will take any HDMI signal and duplicate the signal, sending the same high definition signal to 4 displays simultaneously. The supports Ultra HD 4K/2K resolutions and all 3D resolutions. The heavy-duty aluminum alloy enclosure protects the insides and keeps the unit cool by aiding in quick heat absorption and dissipation. Dingsun HDMI splitter's core chip comes from the ITE company of Taiwan, and MCU is manufactured by ST: SGS-THOMSON Microelectronics. It features an internal amplifier, which boosts the HDMI signal and allows the use of longer than the normal HDMI cable runs. The HDMI splitter also has the ability of buffering and amplifying, and can achieve long distance transmission of HDMI signal of up to 20 meters. Split a single HDMI display source to multiple HDMI displays. HDMI v1.4 supports a wide range of resolutions and is reverse compatible with previous generations of HDMI found in older monitors and TVs. 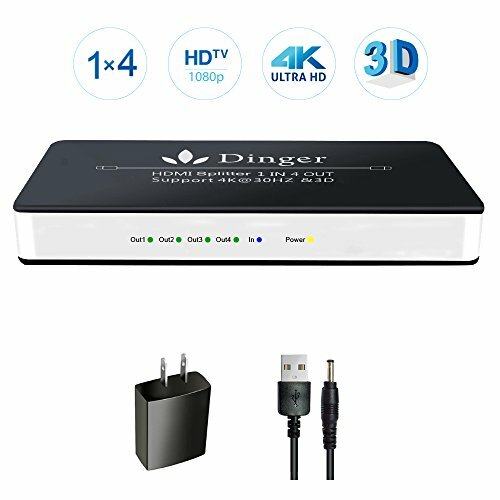 Dingsun HDMI splitter compatible with Xbox One, Cable Box, 4K TV, Projector, HDMI LCD, DVB receiver, TFT monitor, Blu-Ray, DVD or HD-DVD players etc. If you have any questions about this product by Dingsun, contact us by completing and submitting the form below. If you are looking for a specif part number, please include it with your message.